We're releasing a few changes today that people have been asking for. You can now increase the game speed in PVP! We had planned to release this in our next major update, as there is a minor UI inconvenience that is caused by the current implementation, namely that the names of the players will not appear in the lower right corner of the screen. We felt that the benefits of implementing the increased speed option now outweighed the loss of names in the corner of the screen, as you can still see names in the battle log. We will be changing the layout of the button in our next major release so you can see the names again. Auto-Battle will no longer deactivate when one of your heroes dies. We have made some changes to our matchmaking procedures to increase consistency and balance. 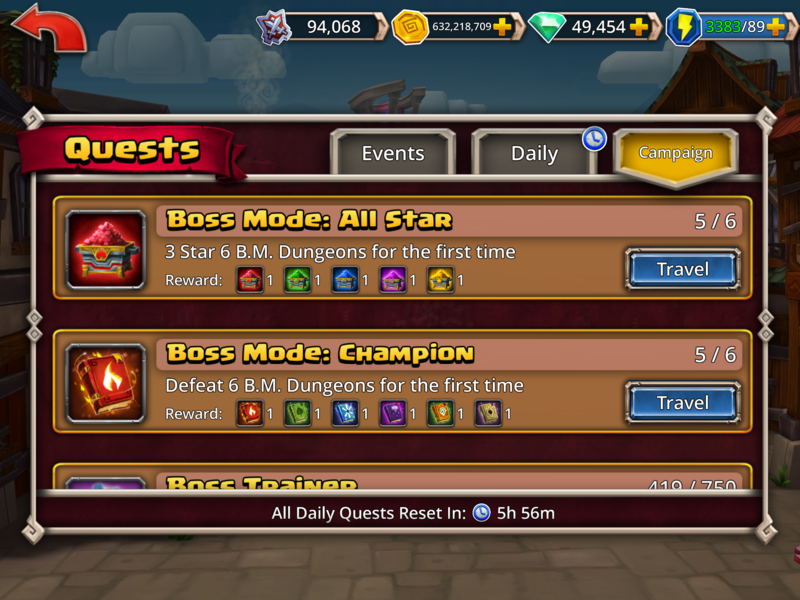 Boss Mode quests have been re-added and are infinitely repeatable in anticipation of future dungeon releases. NOTE: This is NOT an indication of impending releases, just the groundwork for inevitable additions down the line. Was it intentional to add additional B.M. Campaign quests even though I have three stared all of them? I collected them 3 times just now and they’re still there. This was inevitably implemented to make all of us poor VIP 10 schmucks that could never complete the Boss Trainer quest and thus finish all the campaign quests feel better about ourselves since now everyone else is stuck with non completable quests as well! Not sure I understand why you'd make a widely mocked quest line with rewards that were pretty much irrelevant by the time you earned them even when first implemented (nevermind how much more irrelevant they've become since then) infinitely repeatable. The quests don't mean content is coming, they're just there because content is coming! We can only hope, @JackHallow666, but as Joel said it is not because content, there probably isn't soon. You haven’t. You’re missing one. It’s actually an even multiple of six. @eej @joel Thanks for the 2x speed in the PVP, but it would be even better if our preference was saved between launches of the app. I have to change this to 2x again and again because I have to force quit the app so often to avoid it crashing during a raid. Truthfully, I don’t think anyone is toggling the speed during play other than to get it to 2x. Take the button off the screen and just have us set a preference elsewhere, via the upper left menu for example. So far matchmaking still broken. Nothing changed with the patch. Horrible matchmaking. My hard was just a level 66 goblin team with 309 rune power. This is NOT fun. Combat revamp is not matchmaking. I checked and all are 3 starred. I guess the game can't count. Such a shame, I need those books so bad. 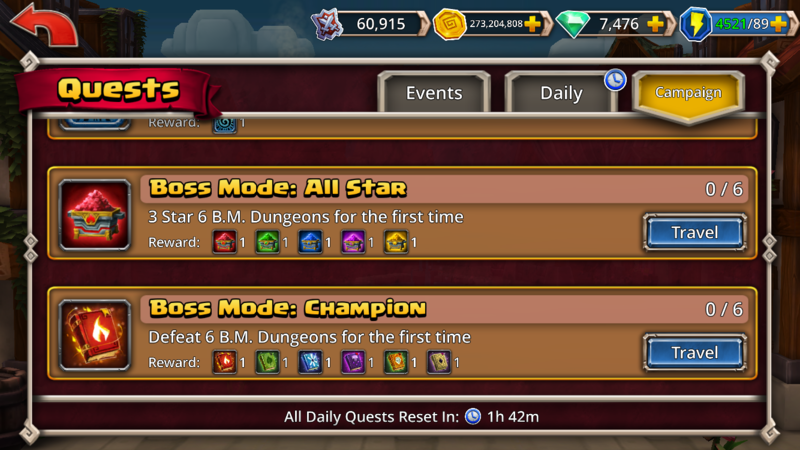 Mine checks out i have everything done and 3 starred and i'm sitting at 2/6 on each quest. 2. Excellent, thanks! Especially with Solaris doing his suicide this is appreciated. 3. Yesterday evening I had a string of easy 'hard' matches with opponents with poorly arranged teams at 20k total strength (loved it, pushed back into Legend II), today it's back to around 30k with 5k+ of runes or beast-centric teams. I'll be interested to hear from some of the people who have felt victimized by hundreds of attacks a day if this makes a difference. Time will tell. 4. Slightly confusing to have these back when I cannot currently attempt to complete them. At least I don''t have to look at them often. @ExtremeKorosPains no, it won’t affect matchmaking. They indicated they had made changes to matchmaking but it is clearly still broken with super easy defenses being handed out. @bvs72 I have to think it’s a legendary dungeon or something that you’re missing. So something that is locked currently and not visible on Boss Island. And yes, those rewards are amazing. I’m sure you are desperately needing additional tomes and binder. Aren’t we all? @Wolfreich Legendary dungeons. Four more remaining. Go! I agree, matchmaking if anything seems worse than ever. It includes the 20 stamina dungeons too. Maybe you haven't done all of those? Or maybe you have done an amount of those equal to 2 mod 6. For those of you still having matchmaking problems, can you please PM me screenshots of your potential opponents? @joel What kind of problems exactly? The matchmaking is equally easy, painfully so, for pretty much everyone. I shouldn’t be getting level 66 goblin teams with 309 rune power when I’m a level 70 and over 100k trophies. The problems have been in place for a little more than a week here. This isn’t fun. This is boring and dumb. Anyone with the gems or raid tickets can sit and plow through 50 easy defenses in a row. Maybe that works for Recruit or Brawler, but we shouldn’t be seeing these kinds of defenses up in Legend. As far as I can recall, the "hard" matches happen in Warlord and the higher I progress into Legend, the easier the matches get. Warlord I would face 25-30k teams, now I'm in Legend I and seeing 15k-19k "hard" choices. We're aware, hence our efforts to fix it. Matchmaking is a complex process though, it's not an overnight fix. If you can PM me screenshots of your potential opponents, it may help us fix things faster. Do you really want us to send you every single screen shot for 50 matches in a row? Because that’s the issue. It’s not occasional fringe cases that show up which don’t belong. And it’s affecting pretty much everyone at the top of the pile — this isn’t isolated, this isn’t occasional, this is persistent and widespread. If you want me to be a paid play tester, then send me a big pile of raid tickets and I will dutifully run through the entire heap and record every single right matchup and send them all your way. But this is something that pretty much any account you plop into the Legend tier with a decent pile of trophies should be experiencing. Do you have accounts that you can play test vs. the live matchmaking system? I think what he's saying is send him a couple screenshots showing some EXAMPLES from the 50... basically he's saying whatever you can do helps. You don't have to go ham on this lol. HUGE DIFFERENCE. Thank you, @Joel! We released a second set of changes today. @FatCat69's comment has me hopeful.